Enoshima, Fujisawa, located in south Kanagawa is an island often busy on the weekends thanks to its great access from Tokyo, Yokohama, and other cities. In this article we introduce you to recommended spots to visit and foods to try in Enoshima! Enoshima is a small island located in south Kanagawa prefecture in the city of Fujisawa. Here you will find a beautiful view of Sagami Bay and Mt. 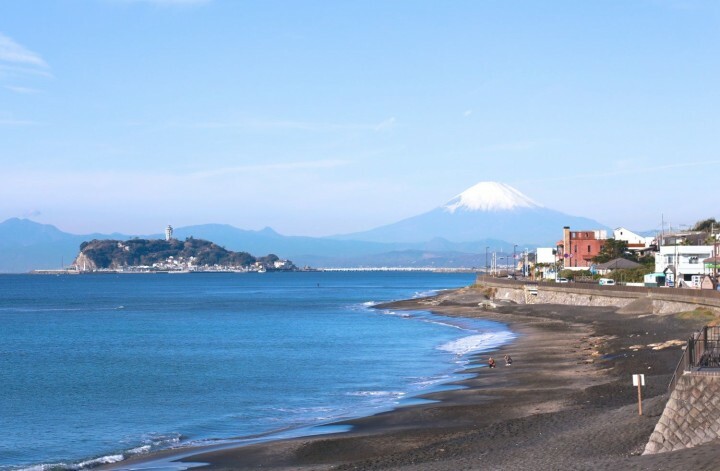 Fuji, which has resulted in Enoshima being a popular sightseeing area since the Edo period. As this is a spot you can leisurely sightsee within half a day with easy access from the city, the island is often busy with people on the weekends. The island is geographically similar to that of a small mountain, so it would be best to visit with clothing that is easy to move around in when you visit. Access is about 20 minutes on foot from either Enoshima Station on the Enoshima Electric Railway (Enoden) or Shonan-Enoshima Station on the Shonan Monorail. It’s also a fifteen minute walk from Katase-Enoshima Station on the Odakyu Line. Without further ado, we introduce seven things to enjoy in Enoshima. Enoshima Shrine is a site you can't miss when you come to Enoshima. The shrine is composed of three smaller shrines: Hetsumiya, Nakatsumiya, and Okutsumiya. They are scattered along the island. Enshrined in these three shrines are three goddesses that preside over the safety of voyages. These three goddesses are also believed to represent Benzaiten, the goddess of the ocean. Benzaiten is a goddess that gives blessings in happiness, riches, and proficiency in the performing arts. A statue of Benzaiten has been enshrined in Hetsumiya’s Ho-an-den, known as Enoshima Benzaiten since ancient times. This statue is considered one of Japan’s Three Great Benzaiten alongside Itsukushima Shrine in Hiroshima. Each shrine is about ten minutes from the other. You can leisurely walk to each shrine or you can move around in comfort using the Enoshima ESCAR, an outdoor escalator. Cross the Enoshima Benten Bridge by walking from the station, and the first thing you’ll see when you arrive in Enoshima will be the bronze torii gates. You’ll find rows of souvenir shops near these torii gates as well as on the road leading into Enoshima Shrine. It’s here where you can try and enjoy treats unique to Enoshima. There’s so much food here to the point where you’ll find it hard to decide what you want to eat. Some options include croquettes filled with shirasu (whitebait), a special product of Enoshima, seafood snacks like ikayaki (grilled squid), odango (sweet dumplings), soft serve ice cream, as well as local beer. At Asahi Honten, you’ll often find long lines thanks to the popularity of the tako senbei (350 yen plus tax), a snack containing an entire roasted octopus. It has a savory soy sauce and seafood flavor. The simple flavor and crispy texture convinces us why there are so many fans of this senbei. We also recommend the ice cream monaka, a Japanese dessert from Inoue Sohonpo, containing ice cream and sweet red bean paste sandwiched between crispy baked dough shells. The ice cream is available in three flavors: matcha, vanilla, and red bean paste, so you can choose your favorite. At the Enoshima Samuel Cocking Garden, a botanical garden bursting with a tropical atmosphere, you can enjoy flowers and plants every season. SeaCandle, an observation deck that is one of symbols of Enoshima, is also located within the garden. From here you’ll have a view of the ocean and Mt. Fuji. Various events are also held in each season. In particular, there is an illumination event that envelops the garden in a magical atmosphere. Lovers’ Hill was created from the love story of a celestial maiden (a goddess residing in heaven) and Gozuryu (a five-headed dragon) that has been passed down in Enoshima. The Ryuren no Kane (Dragon Lovers’ Bell) is located on a hill where Sagami Bay stretches out before your eyes. It is said that if a couple sounds the bell, they will be together forever. Surrounding the bell is a fence packed with padlocks written with couples’ vows of eternal love together with their names. Padlocks can be purchased at a store near the entrance of Lovers’ Hill. This is a very romantic spot filled with the happiness of lovers. Iwaya Cave is a cave created from erosion caused by waves over many years. There are two caverns in this cave: the first cavern has a depth of 152 meters and the second is 56 meters. Legends remain telling of famous shogun and priests that once visited the cave. When you enter inside the cave, you’ll feel a dark, yet very mystical ambience. Borrow a candle and continue further into the cave. Once you’ve traveled through the cave, you’ll arrive at a rocky area called Chigogafuchi. This area has an extremely scenic view of the sunset and Mt. Fuji. It was selected as one of Kanagawa’s Top 50 Places of Scenic Beauty. There is also another route you can use to get to Chigogafuchi without going through Iwaya Cave. Being able to swim in the ocean during the summer is another charm of Enoshima. Katase Enoshima Beach is just a stone’s throw away from Enoshima and will be crowded with people during the middle of the season. Firework festivals are also held from the end of August to the end of October at this beach. It’s rare for firework festivals to be held during the autumn, and has become characteristic of this season in Enoshima. At Ryukoji Temple, about a three minute walk from Enoshima Station on the Enoden, the Tatsunokuchi Bamboo Lantern Festival is held in early August. The temple grounds will be lined with 5,000 lamps made of bamboo during this time, producing wondrous scenery in the temple. Enoshima Aquarium has exhibitions based around the Pacific Ocean and Sagami Bay, where rich marine life has existed since ancient times, together with the organisms that make these waters their home. Of course, you’ll be able to see the idols of the sea from colorful fishes to penguins, seals, and dolphins, along with charming and unique exhibitions. For example, there’s Jellyfish Fantasy Hall where you can immerse yourself fully into the incredible world of jellyfish aided with light productions. Here you’ll find thirteen water tanks of various sizes in a semi-dome-like space made to resemble a jellyfish’s body. A spherical water tank called Jellyfish Planet is also located at the center of the hall. Fourteen species of jellyfish are always on display in this area. In the Sagami Bay Zone, you can learn about the waters of Sagami Bay and find an exhibit of shirasu, the local specialty of Enoshima. This is the first permanent exhibition in the world for the species. Both children and adults can enjoy the deep world of the ocean here at this aquarium. Enoshima Island Spa is a spa where you can soak in natural hot springs. They have baths where you can relax in the hot springs while gazing at the ocean. There is also a pool area you can enter with a swimsuit. In this area, you’ll find pools made in the image of jacuzzi and caves, along with a break area attached to the pools and café. Here, you’ll be able to comfortably have fun in the water. Pass under the waterfall from inside the cave to find an open air pool that gives you an ocean view! The pool is heated in all year except during the summers, so you can use it to relax even during the chilly seasons. Venture a little further and you’ll find a bath you can soak in along with summer beds on the poolside. You can spend a luxurious time here while looking out over the ocean. The area is also complete with a café, restaurant, and relaxation services. If you come to Enoshima, local dishes made with shirasu are something to definitely try. Shirasu is a type of whitebait. The Shirasu Rice Bowl, a bowl of rice topped with shirasu boiled in salt water, is a classic in Enoshima! The combination of the aroma from the beach wafting faintly in the air, the soy sauce, and the rice, is irresistible. Shirasu rice bowls can be eaten at many restaurants in Enoshima. However, Tobiccho is particularly famous for this dish. In particular, the Nama Shirasu (raw sashimi slices of shirasu), containing fresh shirasu, is popular among the locals. The restaurant also serves the slightly unusual Shirasu Burger. Satsuma-age (*1) is used in place of a meat patty while the hamburger itself is made with a generous helping of shirasu and wasabi-flavored mayonnaise. It has a much lighter flavor than a traditional meat patty. In addition to these dishes, you can also try other seafoods including sashimi (raw sliced fish), common orient clams, and turbo sea snails depending on the restaurant. Definitely please try a variety of local Enoshima dishes. *1 Satsuma-age: a type of Japanese dish made of ground fish molded into a shape, then fried with oil. Not To Be Missed In Enoshima: Tobiccho's No.1 Shirasudon Rice Bowl! Enoshima can be accessed in 23 minutes by Enoden, from the ancient capital of Kamakura. We hope you visit both areas. Seeing Kamakura and Enoshima together in one day, however, will be difficult. You won’t be able to fit in enough sightseeing, so we recommend enjoying both areas by lodging nearby. You can then spend one day in Kamakura and spend another day in Enoshima and nearby sightseeing spots.